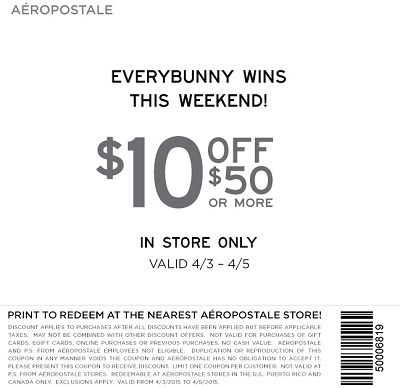 Everybunny wins this weekend at Canadian Aéropostale stores. Use a special sale coupon and save money! Take $10 of purchase of $50 or more. Print to redeem at the nearest Aéropostale store. Source of the information is Aéropostale emailing. More information about the coupon at stores or online.